I’ve been lucky enough to live in Paris for almost a year now and am currently enjoying my first Parisian Spring, so I am by no means an expert on Paris itineraries, but when French Wedding Style asked me to contribute a post on my favourite romantic places in Paris, I started thinking about what my must do list would include if I was only visiting for a weekend. There are far too many lovely places to visit in Paris to list here, and there is far too much listed here to do in one weekend, but hopefully that just means an excuse for you to visit again soon. I hope you might find this guide useful to if you are in the process of planning a weekend in Paris, and that you might be able to pick out a few things to try next time you visit. As with most places in Northern Europe, Paris is a very seasonal place, so I have made the following suggestions based on a Spring/Summer visit. After writing this guide, I also realised that it’s quite food-centric, but hopefully all the walking around Paris will mean you have enough of an appetite to sample many of the delicious things Paris has to offer! I love going to my local French market in the mornings at the weekend and picking up the fresh produce we need for the week, practicing my embarrassingly rusty schoolgirl French on unsuspecting French people and buying peonies when they are in season. I live in the 16th arrondissement so I like to go to the market on Avenue du Président-Wilson, but there are so many all over Paris. The array of different colours and shapes of vegetables available (and meat...brain anyone)?! are really inspiring if you are into cooking and we love to try to pick up ingredients that we haven’t used before, like different varieties of mushrooms or celeriac, and then see what we can come up with. I often end up getting advice on cooking techniques from sweet older French ladies, which is always lovely too. Later in the day, a visit to an antiques market is also super fun. I love searching for pretty French vintage finds for our apartment - at the moment I’m hoping to start to build up a set of mismatched silver cutlery. My favourite museum in Paris is the Palais de Tokyo. I love modern art and the installations there are always thoughtfully curated and interesting, from clingfilm tunnels on the ceiling that you can climb through, to ridiculously lifelike robots. 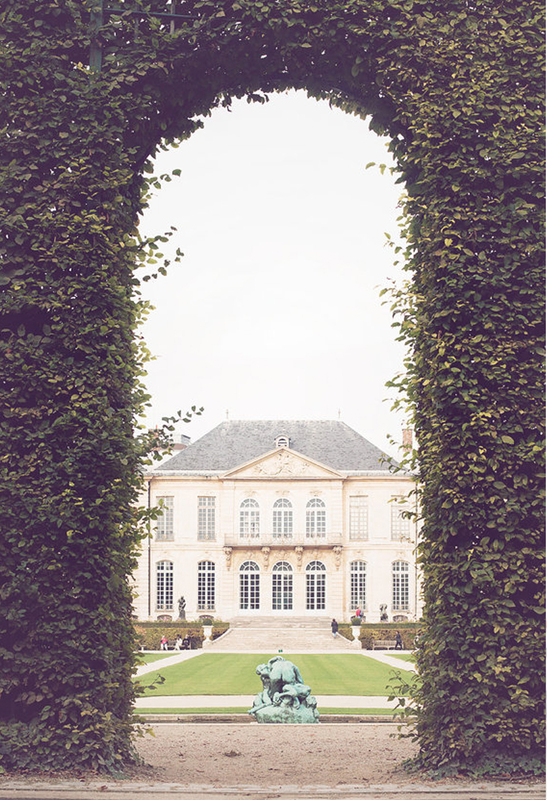 The Rodin Museum, as well as its gardens should also make up part of any romantic visit to Paris and the Picasso museum is worth seeing too. Another, slightly odd, favourite of mine is La Musee de la Chasse et de la Nature in the Marais. It’s a very small and not that well known museum/gallery combining modern art with a stuffed animal collection and a small room dedicated to unicorns and other mythical horned animals. The Frank Gehry designed Louis Vuitton Fondation in the beautiful Bois de Bologne is also worth a visit if you have time, for the architecture alone. A bus runs every 15 minutes from the Arc de Triomphe. No trip to Paris is complete without a visit to Montmartre and I like to wander up through Rue de Martyrs in the 9th towards the Sacré Coeur. Rue de Martyrs has a lovely village feel and don’t forget to try a couple of the unbelievably good chou from Popellini, and stop in at L’Objet qui Parle for the best selection of vintage finds. Shopping is definitely a key part of any weekend in Paris, and the best place to head to is the Marais. If you are visiting in January or June the annual sales (les soldes) are on. French brands I like to stop into for a browse are APC, Sandro, and Maje for clothes, Merci, Dipthyque and Astier de Villatte for homewares and the most beautiful luxury candles. After shopping you can wander through the falafel shops on Rue des Rosiers and then relax in the beautiful Place de Vosges, stopping in for a couple of macarons or an eclair at Carette if you’ve worked up an appetite. Maison Plisson is also a great new place to stop for lunch. If you decide to visit the Louvre, it’s also worth visiting the Tuileries gardens, wandering along Rue de Rivoli, stopping in for the best hot chocolate at Angelina, and visiting the designer shops on Rue de Faubourg Saint Honoré. There is always huge queue outside Louboutin, so get there early if you are on the hunt for something special. We were lucky enough to live just off this street by Hermès, across from the adorable Village Royal when we first moved to Paris, so wandering through this area is a reminder of that Summer for me. Don’t forget to look up all around Paris and take in the beautiful Haussman architecture - one of my favourite things about Paris. If you are lucky enough to visit Paris during the Spring cherry blossom season, make sure you make time for a walk through the Jardin du Champs-de-Mars and a picnic with a view of the Eiffel Tower with your love. What could be more romantic than that? You can follow it up with champagne in an outdoor terrace or somewhere like the new Ralph Lauren cafe, or a roof terrace with a view like Le Perchoir. After a walk along the Seine, picking out the prettiest bridges, you might like to head to Canal St Martin. If you know London, I sometimes explain this area as being a bit like the Shoreditch part of Paris, although that doesn’t really explain it properly as the cities are so very different. Canal St Martin is definitely a bit more alternative than some of the more conservative parts of Paris. Worth checking out are Le Comptoir General, Le Pavilion des Canaux, Ten Belles, Liberte and Du Pain et Des Idees. It’s also a great spot to grab some cheese and wine for an informal picnic by the canal. For dinner in Paris I think you have two options when visiting - either going for the classic French Bistro or something which is a bit more modern, whilst still French. Current great more modern places to check out in Paris are Ellsworth, Verjus, Clamato, Septime, Hotel Amour, Les Chouettes and Le Dauphin. For something more traditional, I have tried and enjoyed Paul Bert, La Fontaine de Mars and there is also an adorable square in the 2nd called Rue des Petits Pères, with a lovely bar called Bar du Moulins that does very informal food but has a lovely atmosphere, and Le Scossa in Place Victor Hugo in the 16th is my favourite local hangout and is very pretty, with excellent food. Definitely try the Mandarin Spritz if you go there! Let me know in the comments if you are planning a trip to Paris, if you found this useful at all, and I'd love to hear your thoughts on any of the places mentioned or any places that I must try! A huge thank you to the ridiculously talented Rebecca Plotnick who provided all of the imagery for this post, available to purchase from her Etsy shop here. Also, thank you to the following bloggers and Instagrammers who have personally, or through my reading of their blogs, introduced me to most of the places mentioned here. All of the below are definitely worth reading if you are planning a trip to Paris!